It was oh-so-nice and chilly overnight, and foggy in the morning, though once the fog burned off, it started warming up very rapidly. Peter had left Imbil for home at 4 AM because he had, as usual, dozens of things going on he needed to take care of. Before the heat got too out of control, Penny and Brooke went for a ride on Don and Bronco, and Melissa and Alexandra went for a ride on Kamahl and Jazzmin, while Jaimee cooked breakfast sandwiches, ham and eggs, for us. 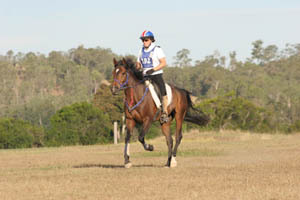 Alexandra is a year too young to ride in 160 km FEI rides yet, (14 is the limit) but she’s looking forward to her first one. After lunch we took the horses out for a walk, which turned into more of a grass-eating outing. This was the first real grass the horses had seen in who-knows-how-long, and we let them rip it up. We didn’t have much of a choice anyway because we couldn’t drag them away! It got so hot in the sun that we retreated to the shade of a big tree and let them eat under that for a while. We had to tug hard on them to get them to go back to their pens. Jaimee and Penny noticed later that Don was not happy because all the horses had to go through his pen to get to theirs; so Don was moved to a back pen where he wouldn’t be bothered all the time. Friday night after dinner, Penny pulled a chair up in front of Don’s pen. “Admiring your horse?” I asked. She said “I’m studying him. Wondering what he’s thinking.” I think she’s besotted. Not too many more people had pulled into the Fairgrounds yet. Everybody in the Toft corner crawled in bed by about 8:30, and all was quiet on the ridecamp front. In the morning after feeding everybody, Jaimee noticed that Don wouldn’t eat his food, because, back in his front big pen, his feed bucket was too close to the gate where people kept coming and going to get things. So she moved his bucket of food to the back of the pen, and there he stayed, happily eating now, further away from humans. Peter returned this morning, this time to stay through the ride, and, his phone didn’t even ring off the hook. Well it did ring, but not constantly. He even sat down a little while under the big tent we’d had put up at our spot, though he couldn’t sit still for too long. He had all 5 horses brought out to watch them trot out. From watching and studying them, and giving them all the once-over, he decided Penny would of course still ride Don, Brooke would ride Zalman, and Melissa would ride Kamahl. Then they saddled them up and took them for a ride; Peter said I could take Penny’s car and drive up the road a ways and take pix. Yikes! I did, driving very carefully, and sweated in the heat waiting for them. It really was very hot today… not Malaysia hot, but unseasonably hot for this time of year here. By now, at the Toft’s farm, horses are normally wearing two rugs during the day. Just the thought of a rug, any rug, even their light ones, made me wilt. Back at ride camp, friends of Melissa’s, Jackie and Geoff Richards from Cooroora Arabians, stopped by; I got another “Oh you’re the Raven lady!” It seems my stories are going around Australia’s version of ridecamp, and some Aussies are also contemplating possible Raven replacement solutions. : ) (Stay tuned for a comprehensive Raven update). I also met Sue Crockett the photographer whose good photos I’ve seen in a number of endurance magazines in Australia and New Zealand, and her husband Toby. Later the horses were saddled up again for a ride, and I got to go along with Melissa and Alexandra, on my buddy Bronco. We headed up the road and did a little 10 km training loop through the pine forest (no eucalyptus here), and already with that little bit, I would have been lost! There were big arrows marking the trails here, in different colors, but I just seemed to miss some of them! Good think I wouldn’t be whizzing along in the dark on this ride. We met quite a few riders coming and going, but there weren’t too many boisterous hellos. Maybe it was my reputation as a New Zealand Dreg, or maybe it was the company I was keeping, or maybe it was just that all the riders were concentrating hard on their challenges for tomorrow. Or, it was too hot and everybody was stunned from the heat. Or maybe it was that everybody else had been there before, and I was overly excited just to be lucky enough to be riding a horse with good company on a new part of the planet. Too bad the Raven wasn’t riding along, because he would have been having a great time too, and people probably would have recognized him! 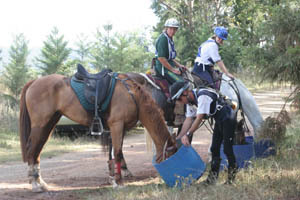 When we got back to camp, Penny and Brooke and Melissa got their tack ready, and the Toft crew set up buckets and things for the strapping. 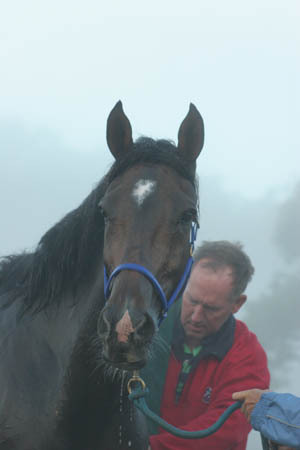 Vet-in was at 2:00 PM; and while those of us without horses were watching, Mark Tylie, the young man who won the New Zealand Nationals appeared, and said “I have a package for you.” He was kind enough to bring me my credit card that has been chasing me around the world for a while. I think the card has more air miles than I do now. Mark wasn’t riding; he was just here to watch the ride. 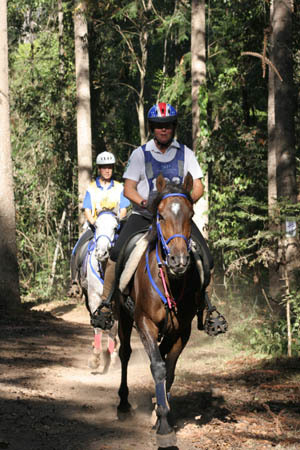 Sample and Partners sponsored this first FEI *** 160 km ride in this part of Queensland. There was only this 160 km ride and no other distances; I’d talked to some people who weren’t coming because they weren’t ready for a 160 km this early in the season. So the Imbil ride probably missed out on a bigger number of riders, though putting on an FEI the first time was probably a big enough task that they didn’t want any other distances to deal with. At the 5 PM ride meeting, Bob Sample talked about the ride, and gave out the official ride time, which we all set our watches to. He said temperatures were 6-7* above average yesterday, so that was going to make it harder on the horses. FEI requires 6 loops, so they would be: loop 1 - 37 km, loop 2 - 30 km, loop 3 - 26 km, loop 4 - 31 km, loop 5 - 21 km, loop 6 - 15 km. Pulse criteria 64. 40 minute holds except for after loop 4 (60 minutes, with a represent 10 minutes before going out) and the final hold of 30 minutes. 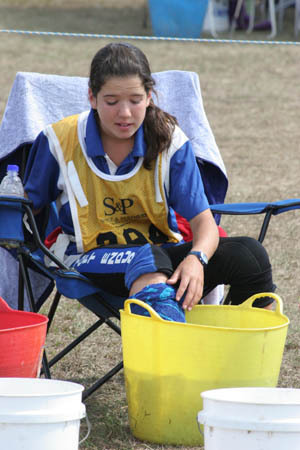 Because there had to be 6 loops, the course was harder; it took 15 km to get out to where the hills flattened out and 15 km to get back, so there was no chance to even get to the flat ground, so much of the course would be challenging hills to climb. There’s talk of making it a choice of 5 or 6 loops in the FEI rides. I agree with the sentiment that the more loops you have, the more it puts the responsibility of the welfare of the horse on the veterinarians, and that’s not right. 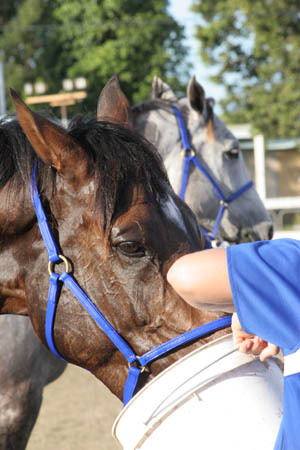 It’s the rider’s responsibility to know and take care of their horse, not the vet, who sees the horse for maybe 2 minutes. 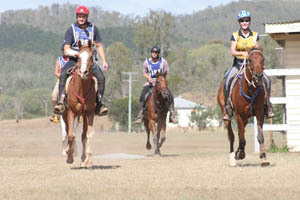 39 riders were entered - 25 Open riders and 15 in the Youths. Since the ride was starting at 2 AM and we were all getting up at 1, we all went to bed around 8 PM. All except for Louis and Sharon who’d help with strapping, who were on their way from Marburg. Their first vehicle broke down on the way so they didn’t arrive till 11 PM in another one. Okay, this time, I managed to be up and present for the start of a ride. This starting rides at midnight, or 1 or 2 AM is just at a time I’d rather be snoozing! 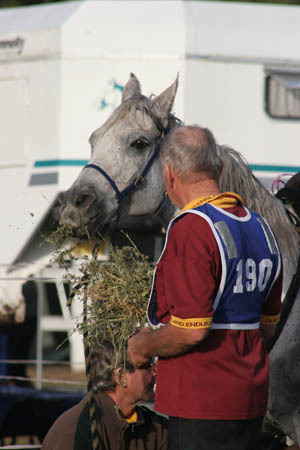 39 riders left the Fairgrounds behind Bob’s vehicle in an orderly and unruffled start. Don and Zalman were in the middle of the pack as they trotted past me out into the night. While everybody stayed up and waited the 2 hours 15 minutes (Peter’s prediction) for Don and Zalman to come in, I couldn’t help myself, I crawled back into my tent just to lay there for a few minutes. Predictably, it turned into a full-out unapologetic snooze, which lasted till 4 AM, when I crawled out to join the others. Sure enough right around 4:20, in came the first 3 riders, Penny, Brooke, and Brook Sample on Brookleigh Casper. It was quite cool and damp for us sitting around waiting, but Penny and Brooke said it was very hot out there on the trail. 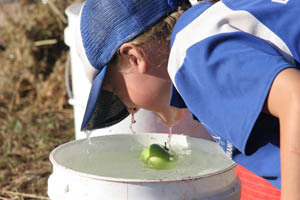 While the horses were warm, we didn’t yet need ice water to cool them down. And when I say “we” I mean “they” the strappers, I stayed close to watch, but stayed far out of the way. 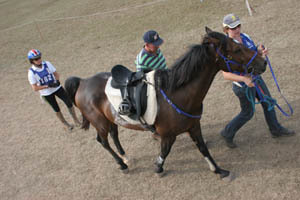 Adbullah and Mada had also come to watch the ride, and they were helping strap. The Toft team had their precise techniques down, everybody doing their job at the right spot and right time, and I wasn’t going to get in the way! The horses vetted through nicely and ate throughout their vet check. Going out on the second loop, it was discovered that the official clocks were 5 minutes faster than the time given last night, so some riders went out late, some went out early by the original official time… it took a few loops to work things out, and by then I was so confused on the times that I couldn’t even tell time anymore, so I just stuck to taking pictures. Melissa came in looking good on Kamahl off the second loop; as they were cooling him down they checked his feet, and Abdullah noticed that the pad on the first foot he looked at had an air pocket in it - it was supposed to be sealed with silicon - and they found the silicon had disintegrated and the pad was ripped. It had happened to all four feet, and it turned out to be bad luck, as Kamahl vetted out lame. Too bad, because Melissa was really pleased with how strong he felt. I spent some time out on course photographing with Sue Crockett and another regular photographer, Peter Jackson, a jolly Scottish Aussie who just loves the endurance riding. I quite enjoyed their company. We found a spot up on top of a hill, at a water stop and checkpoint, overlooking the forest. It was actually pleasant up on the hill there sitting in the shade. The riders said it was hot in the sun, (but not as hot as yesterday) but fortunately they were in the shade about half the time. Back at base camp, Penny and Brooke and Brook were still in the lead, coming in about the same times together. 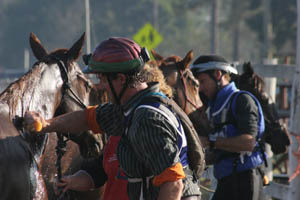 It was still hot, and they were now using ice in the spray water to cool the horses down. Penny said Don was just great today, he didn’t run off like a bat out of hell, he let Penny control him and wasn’t pulling on her, just flying along steadily. Of course, she kept her fingers off his Go button behind the saddle. 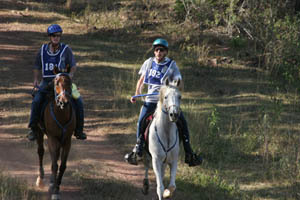 Brooke, riding beside and behind him on Zalman, said Don was just amazing, he just goes and goes, he’s like a machine. 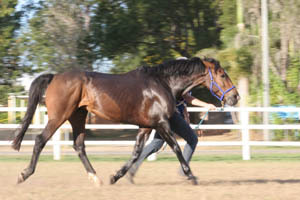 When Don was trotting, Zalman had to canter to keep up with him, and when Don cantered, Zalman had to gallop - and they’re about the same size. While being strapped, Don puts up with it, since he knows what they’re doing and likely cool water feels pretty good. When he goes into the vet ring, he stands there with a scowl on his face, not liking being touched, but he just puts up with it because he knows it will be over soon and people will get out of his face for a while. He pins his ears and scowls as he’s trotting out, as if this is all silly and something just to be tolerated. I think that if Don could just do everything himself, vet himself, cool himself down, he would do it just so people would leave him alone. Brooke and Penny and Brook were still within minutes of each other coming off the 4th and 5th loops; Brook Sample ended up winning on his gelding Brookleigh Casper by 9 minutes. They all finished around 4 PM, under the magic ride time of 10 hours 40 minutes. 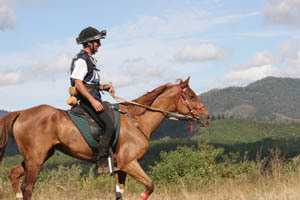 Bob Sample had predicted the winning ride time would be around 10 hours. Penny couldn’t watch Don be vetted through (though I think she peeked); Jaimee vetted him as she’d done all day, and Louis took Zalman as he had all day. They both vetted through great, as did Brook Sample’s horse, and everybody clapped and breathed a sigh of relief. Peter was holding Don afterwards, and I teased “I bet he looks kinda pretty now, doesn’t he Peter,” and Peter tried not to smile. Our horses were taken back and hosed again, given the good food, and immediately got all 4 legs wrapped, and left to rest. Louis and Jaimee run fine bandages. Jaimee’s worked for the Tofts for 3 years, and Louis, from South Africa, has been with them for 5. Don was getting cranky that so many people were fussing over him, and later Emma the massage therapist, who’d come with her husband, worked on Don. He was pinning his ears and swinging his head around to her as if to bite her, but he never did. Riders trickled in throughout the evening into dark. We went into town for food; at the café we ordered food, and cappuchinos, and desert and more cappuchinos. Louis was starving and the others were quite tired. 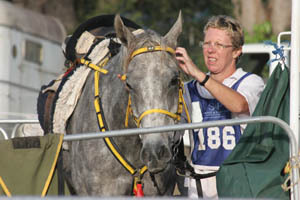 Sharon was about to drop - it was her first time strapping at a ride, and it was off about 1 ½ hrs sleep, following a full (very successful) day at a show with her daughter Shaylee (among others, Shaylee rode Bremervale’s stallion that she rode at the last show, and they got Supreme Champion yesterday). Peter and Penny joined us, arriving in timely fashion just as the food was being served. Peter was already looking ahead and thinking about the next ride and possible horses to go in it, and to next day’s work line-up and work at the farm - always thinking ahead, never a rest. The nice ladies in the café had already had a long day (some art show in town, lots of people), and I think they were so glad their day was over and we were finally done ordering and eating, they gave us our 3 cappuchinos and my ice cream free - one lady had said, “Oh, you should have tried the macadamia ice cream - I’ll bring you a scoop” which she did, plopping another one on top of the ones I already had. I sure didn’t complain! Back at ride camp, Peter had decided he wanted Zalman and Don walked every 2 hours through the night, since they’d both be showing for BC tomorrow. The 5 of us were trying to figure out who would take what shifts, when Peter changed his mind and said just do it at midnight and 4. Sharon went straight to bed, and I told Melissa to wake me if Sharon wasn’t up for the 4 AM one. I popped in earplugs, and covered up in the blessedly cooler night, and crashed. I don’t think I heard Melissa get up to walk the horses. I did take my earplugs out at some point and slept some more. I did wake up about 6 when I heard rain - rain! Which only lasted about 2 minutes. 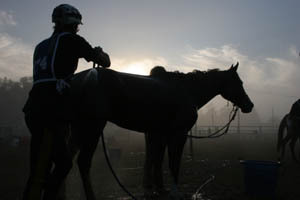 Peter and Jaimee were already up walking the horses when I got up at 6:30. We started packing some things away , and then it was time for the parade of finishers and the BC judging. 7 of the 15 juniors finished (2 withdrawals, 1 metabolic), and 10 of the 25 open riders finished (5 withdrawals, 1 metabolic). A low completion rate, but it was probably good to see those withdrawals, thinking on the hard ride and hot day. 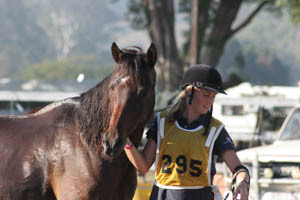 3 showed for the junior BC, but one girl’s horse was lame hand-trotting out, so she withdrew. Zalman looked great on the ridden part. Brook Sample’s horse Brookleigh Casper and Don looked by far the soundest, though Don doesn’t care a whit for arena work and hasn’t been trained in it. Penny was saying “Whoa” to him over and over because she felt like he might start bucking. I thought he might just run off back out onto the course for another loop! Brook Sample’s horse did some flying lead changes. Toby Crockett said “Here comes a Mountain Man show,” and I think Brook’s known for his flying lead changes in BC showing - which this horse did. Back at camp we continued packing things; Penny cooked us all ham and eggs and I made coffee. We loaded up the horses, and Peter left with them and Melissa, who he was dropping off at the airport. We were ready to go just as the meeting started; we went to the clubhouse, where complimentary food was set out, and sat through the awards… BCs went to 2nd place Kaylea Maher and Raaward Kasmin, and BC went to Brook Sample and his horse Brookleigh Casper. Nice completion awards were handed out - handy push carts for camp for the finishers and bronzed horses and horse head statues for the top 5. What a shame Peter Toft lost his temper (again) at this ride and left a bad taste in the mouths of all who witnessed his tantrum. The resulting yellow card may cause him to re-think his actions.